If copyright were really property, like a house or cell phone, most Americans would belong in jail. That nobody seriously thinks infringement should be fully enforced demonstrates that copyright is not property and that copyright policy is broken. Under the Founders’ Copyright, as set forth in the 1790 Copyright Act, works could be protected for a maximum of 28 years. Under present law, they can be extended to 120 years. The massive growth of intellectual privilege serves big corporate publishers to the detriment of individual authors and artist. By discriminating against unoriginal speech, copyright sharply limits our freedoms of expression. We should return to the wisdom of the Founders and regard copyrights as special privileges narrowly crafted to serve the common good. 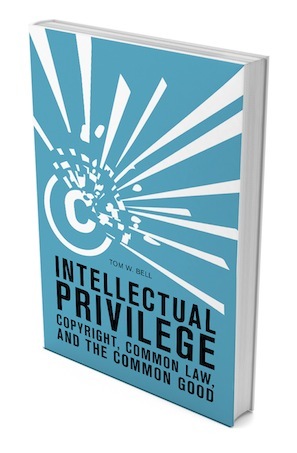 This week, on Wednesday, May 7, at noon, the Cato Institute will hold a book forum featuring Bell, and comments by Christopher Newman, Assistant Professor, George Mason University School of Law. It’s going to be a terrific event and you should come. Please make sure to RSVP.